Posted by TimTheFoolMan in anger, death penalty, Iraq, Morality, pacifism, Politics, Race and Prejudice, Saddam Hussein, Violence, Voting, War and Peace. Posted by TimTheFoolMan in Family, Food, Fun, Travel, Vacation. On the road to Hana, my family stopped at a little stand selling banana bread near Kaenae Peninsula. Below is the view from the shore, across the street from the stand. Posted by TimTheFoolMan in Fun, History, Humor, Vacation. While vacationing in Maui, I saw many places of deep cultural significance to Hawaiians. However, some things, we never found. Posted by TimTheFoolMan in Family, Fear, Fun, Humor, Parenting/Children, pirate day, Snorkeling, Stupidity, Terror, Vacation. No, really. I do. I know that there are things I can do pretty well, such as public speaking, writing, and (in spite of appearances to the contrary) car repair. Posted by TimTheFoolMan in Family, Fun, Love, Parenting/Children, Travel, Vacation. This is one of my favorite pictures, and the inspiration hit me on a complete whim. 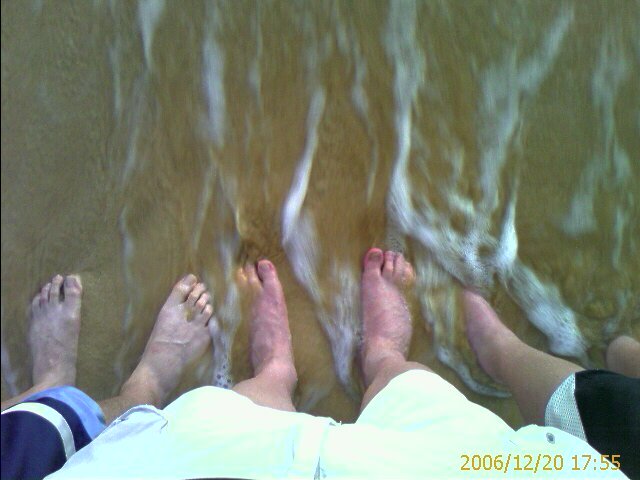 The three of us had been playing football on the beach, and I realized that (with my oldest in college) we might not get a chance to dip all 30 of our toes in the Pacific Ocean again soon. The Pacific Ocean has had all of our feet dipped in its surf, but I doubt that it has changed as a result. Fortunately, the same can’t be said about the three of us.